Web site manager: Eugene (Gene) D. Johnson, son of Ellsworth and Rowena Heffly Johnson. Grandson of Adam LeRoy (Roy) and Wilhelmien (Minnie) Blum Heffley, g.grandson of George and Elizabeth Gillespie Heffley, g.g.grandson of George Henry and Lucy Gordon Heffley, g.g.g.grandson of William and Mary Cain Gordon. Donald Gordon (1877) was the son of Rev. Marquis Lafayette Gordon (1848 - 1900), the grandson of Captain John Adam Gordon, g.grandson of Mark Gordon, g.g.grandson of John Adam Gordon, and g.g.g.grandson of John Gordon (1739 - 1816). He has provided us with two documents on the Gordon Family History. The first is a transcript of the Gordon Family history he prepared for the first Gordon Family Reunion August 14, 1915. The second is the manuscript refered to as, "The Gordons of Greene County", compiled in 1926. Both of these documents are included below. The following is a listing for Donald Gordon published in, "The Abridged Compendium of American Genealogy". 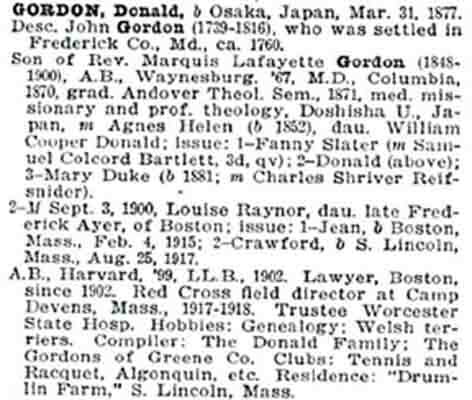 The following transcript of the Gordon Family History was prepared for the first Gordon Family Reunion August 14, 1915, Waynesburg, Pennsylvania, by Donald Gordon a g.g.g.grandson of John Gordon. A BRIEF HISTORY OF THE “GORDON” FAMILY IN GREEN COUNTY, PENNSYLVANIA. “John Gordon, ancestor of the Gordon family of Green County, born in Scotland in 1739, removed to Germany, and thence immigrated to America”. Further examination discloses the fact that John Gordon, here mentioned, as having been the original ancestor of the “Gordon” family in Green County, died on March 29, 1816, aged 77 years. Unfortunately there seems not to be a very complete historical record of his family. There is a sort of tradition that a family of “Gordons” of Highland Scotch origin, and of which there were four sons, sometime about the middle of the Eighteenth Century, fled to Holland or Germany in order to escape political and religious persecutions being waged throughout England and Scotland during that period, and tht after some time the four sons immigrated to America where they shortly separated, one locating in what is now the State of Georgia, one in the State of Maryland, one near the present town of Canonsburg, in Washington County, and one at Mt. Vernon, Ohio. Another tradition has it that one of the sons later returned from the continent to the old home in Scotland, and the other three came to this country , locating in Georgia, Maryland, and Washington County, Pennsylvania. In some respects the latter seems more probably correct for the reason that it is believed that the children of the brother settling at Canonsburg, this State, appear to have separated and some of them gone to the State of Ohio at a very early date. It might be well to remark in passing that Alexander Gordon, a son of the one above referred to, who first settled in Washington County, later took up a large claim, some four hundred acres of land just west of the present town of Washington, in what is now known as the “Gordon Valley”, along a branch of Catfish Creek, and on which is located a part of the present town of West Washington, and several large mills, and on which farm was also made the first oil strike in Washington County, the pay being found in what was then a new sand, and which was named “Gordon Sand”. A descendant of Alexander Gordon, Rev. A. G. Eagleson, of Lore City, Ohio, writing of him says: “He was a man of decided opinions of his own, which he held with great firmness. He thought for himself”. A trait which seems to be characteristic of the Gordons. At the time of the making of these settlements, the country was a virgin forest, filled with wild beasts and roving bands of Indians, ostensibly hunters, but seldom or never too busily engaged in the chase to stop for a massacre of the hardy settlers. The fact that this territory south of the Ohio and West of the Monongahela rivers was set apart as hunting ground, by virtue of treaties among the various Indian tribes living in the adjacent territory rendered dealings with the Indians highly unsatisfactory. There being no tribe with a permanent habitat here made it especially difficult to negotiate treaties with them. No tribe felt bound by any treaty which its neighbors had made with the settlers, and any wandering hunter felt free to wreak vengeance for some fancied reason on the unsuspecting settlers of this neutral ground. There things may account for the fact that so many apparently un-provoked attacks were made by the Indians upon the settlers in this locality, (Godfrey Guseman and Mark Gordon for supplies at Winchester). The first tradition also has it that the two brothers who settled in Georgia and in Maryland had light hair, and that during the Revolutionary War they were Tories, remained loyal to England, and both returned to the mother country during that war, but the other brother, or brothers, had dark hair, remained loyal to the Colonies, and took part in the struggle for Independence. I have not been able to verify these facts, except in part, but give them for what they may be worth. Some time later he emigrated to a point in the state of Virginia, now West Virginia, not far from the present town of Morgantown, but shortly thereafter, in 1795, came to Greene County and tomahawked a claim on the head waters of Dyers Fork of Whiteley Creek. There were doubtless no improvements whatever on this land at the time of his settlement there, and it meant the carving out of a home from the midst of the virgin forest, a task which would have daunted any but the hardy settlers of that time. He was probably accompanied by all of his sons above named, at least, by William, George, John, Or Johnnie, and John Adam. The claim which he blazed was located in what afterward came to be familiarly known as the “Rich Hills”, an unusually fertile section of the country, covered with fine timber, and having a soil of deep, dark loam. The claim contained something over 200 acres. The land was never patented by him, nor did he take out even a warrant of survey, but shortly after his death a warrant of survey was procured from the State by his sons, William and John Adam, in the year 1816, and the same year a patent was issued to them by the Commonwealth for their tract of land, containing, by survey, acres and allowances. In those early days the tournament spirit of the knights of old prevailed to a greater or lesser degree, and many interesting stories are told of the courage and physical prowess of these men, particularly of George and John. They were said to have been tall, broad of back, deep of chest and possessed of unusual physical strength. Some time after his location in this county, John Gordon married Sibley Main, to which union were born two children, Mary, who married Lewis Snell, a German, and Elizabeth, who married Godfrey Guseman, and later James Wells. William Gordon, one of the sons, married Mary Carrell, some reports say “Carl”, but it seems not unlikely that she may have been a daughter of George Carrell, who settled on an adjoining tract of land, and took out a patent naming the tract “Carroll-town”. George Gordon married Eleanor White, who survived him, and John married Nancy Rinehart, a daughter of Simon Rinehart, who had made a settlement on lands now owned by George W. and J. Brice Gordon, along the ridge to the eastward of the “John Gordon Farm”. Eli Holland, who seems to have had some interest in some property in Greene County, Pennsylvania, but who died some time prior to 1824. Such interest as he had was doubtless in a tomahawked or blazed claim, which had never been properly proven under the land laws of this state, and doubtless included some lands subsequently patented by Mark Gordon. At about the time John Gordon settled in this county, which must have been shortly after the close of the Revolutionary War, John Shriver, who is said to have been of Irish, or Scotch Irish extraction, came across the Allegheny Mountains from somewhere to the eastward, and settled further down the creek on the farm now owned by William I. Orndoff. When the family first came to this location there were, of course on improvements and no buildings of any kind on the property. It is said that they erected a camp under the large oak tree which stood until quite recently on a small flat, but a few hundred feet distance from the frame house on this farm, staying there until they should have sufficient time to build a house. A log cabin was erected as speedily as possible, and is still standing. It was occupied by Mr. Orndoff as a residence until quite recently when he built a handsome new brick house above the road near by. The logs were, of course, hewn, but show great skill and excellent workmanship. This John Shriver was the father of Susannah Shriver, who afterwards married Mark Gordon, one of the sons of John Adam Gordon, above noted. A short distance down the creek and early settlement was made at about this time by one John Lemley, who located a claim on farms now owned by Adam Gordon, Brazil Stephens, and others. The log house which he erected is still standing, being used at present as a sheep barn, and like the Shriver house, the logs show evidence of great skill on the part of the builders in hewing and preparing them for the building. An interesting story is told to the effect that a large hollow sycamore, which is still standing along the bank of Whiteley Creek, about 300 yards from this house, was utilized by John Lemley as a hiding place for harnesses, etc., in order to prevent the Indians from steeling; and John Adam Gordon, who, at present, lives on the adjoining farm, states that he has often seen nails and pegs driven on the inside of this tree which are said to have been placed there for that purpose. It is also related that the Gordons were originally Catholics, though they gradually grew away from the Catholic Church, and embraced the Protestant faith. William Gordon, one of the sons of John Gordon Sr., is said to have been a staunch Catholic during the early part of the last century, and it is related tin the log barn which is still standing on the William B. Wood farm, originally owned by William Gordon, and which has always been known as the “Uncle Billy Farm”. The barn to the present day being always designated as the “Billy Barn”. Finally, when a church was built by the Catholic denomination on the present location in Waynesburg, it is said that William Gordon cut on his farm most of the trees which were needed for the building of this structure, hauled them to a rude saw mill, which was located on Smith Creek, where they were prepared for the building and then hauled them on to the site where he helped to erect the building. Subsequently, however, the settlers in this locality became affiliated with the Methodist Church, and the famous old stone school house was built on land now owned by James Zimmerman, but then by Enoch Hamilton, who donated the site. it was a stone building intended as a church and school house, and stood until a few years ago when it was replaced by a more modern school building, but is still known as the “Stone School”. It is also worthy of note in passing that on the ridge, near the present residence of George W. Gordon there was, in the early days, located an Indian Village, and for a long time two large adjoining ranges on the ridge, now owned by George and Brice Gordon, constituted one range, and was always known as the “Town Field”. This is the heart of the Simon Rinehart settlement, spoken of above. As late as the boyhood days of Mark Gordon, who was a grandson of John Gordon Sr., deer were very numerous in the woods round about, and a small conical knoll just above the present house of Frank Shriver, is said to have been a sort of play ground for the deer. Mark Gordon has often related to those still living instances of his having seen as many as a dozen young deer playing about on this open knoll, which seems to have been practically clear at that time. He and his brother, John Brice Gordon, the father of John Brice Gordon, now living, frequently related an experience they had when sent down the hollow below the present residence of Frank Shriver, which was the old John Adam Gordon homestead, to search for some pigs, which had strayed in the woods, and of suddenly coming upon a bear which was making a meal of the pigs where it had caught them lying in the shelter of a tree top. In those early days this locality was dotted over with numerous distilleries, and it is said that our ancestors were more or less concerned in the Whiskey Rebellion of which this District was something of a hotbed. Almost within the memory of those living, one of those early distilleries was still in operation on the farm of J. Brice Gordon, near the tenant house on his farm, and within the memory of Mrs. Porter, her father, Mark Gordon, converted a fine old copper still, which he had in his possession, into a boiler for cooking food for stock. Philip Duke Gordon, who is a son of John Gordon Sr., is described as having been of a rather reckless, daring disposition, somewhat inclined to military affairs, and to have participated in the War of 1812. The powder horn and knapsack which he carried are still in the possession of George W. Gordon. He, it seems, never settled in Pennsylvania, but remained in the state of Virginia. He died shortly after the Presidential Campaign in which Andrew Jackson was elected President. He was an ardent Democrat and when taken seriously ill, sometime before the election, while visiting his nephew, Mark Gordon, is said to have remarked that his one desire was that he might live long enough to vote the democratic ticket once again for President, that if he could cast his vote for Jackson he would be willing to go. His wish was granted to him, but he died suddenly within a few days after he had cast his vote for General Jackson. I. Delilah Gordon, who was born June 20, 1790, and married Adam Shriver. They removed to the State of Ohio, and, so far as I am able to learn, had four sons and one daughter, whose descendents are living in and about Callbridge, Byers, and Kernzie, Ohio. II. One son, Adam Shriver, was a union solder, and was killed in the fight at Atlanta, Georgia. III. A second daughter, Lucy, was born February 9, 1792. She married John Shriver, and they settled near the present town of Burton, West Virginia, but I have not been able to trace their descendents, several of whom live in that locality still. 3. and Solomon, who died July 19, 1852. For her second husband she married James Clark, and for her third husband, Rev. Barnet Whitlatch. No children were born to either of these. 5. Casandra Shriver first married James White, of near Jollytown, and subsequently, Mr. Hennen, of the same locality. 5. Casandra I. Gordon, who married Rev. Taggert, to whom was born one daughter, Sarah, since intermarried with Jackson Waychoff; 6. and James Madison Gordon, who married a Miss Adamson, and to whom were born ten children. This family resides near Claysville, Washington County. Carrie, wife of Herman J. Murdock, and, Lucy, wife of Harry D. Freeland, present County Superintendent of Schools. John Brice Gordon, Sr., in his early days, took a great interest in military affairs, and served for some time as a Major in the Forty-sixth regiment of Militia. He also served two terms as County Commissioner of the County, was a member of the House of Representatives in the years 1847 and 1848. 2. Catharine, married Thomas Porter, and who at present lives at the Porter Homestead in Franklin Township, with her daughter, Emma, who married Frank Lapping. A son, William G. Porter, died some years ago. 3.5. Alice, who married William B. Wood. He was a prominent member of the M.P. Church, and also served as Associate Judge of Greene County for one term. 4.4. Josephine, who married C.E. Bower, both deceased. 5.9. Sudie, who married Thomas Hook, one of whose daughters, Jane Holland Hook, bears the family name of her great great grandmother, Casandra Holland. 6.6. Margaret who married ? Jones. This family is scattered through the states of Missouri, Illinois, Oklahoma, Kansas, Nebraska and Connecticut. 9. Delilah, who married John I. Worley, who died June 15, 1906, without issue, she having formerly married Mr. Higgins. 10.5. William Linn, who was prominent in educational affairs and at the time of his death, in 1886, was President of a College located at Austin, Texas. He has the distinction of having been the first Superintendent of County Schools in the County of Greene, to which position he was elected in 1856, and again re-elected in 1860, when, however, the War of the Rebellion broke out he resigned his position as County Superintendent, assisted in raising a Company of Volunteers, which became Company G of the Eighty-fifth Regiment of Pennsylvania Volunteers, one of the 27 different regiments recruited in part from this county. He was selected First Lieutenant of this Company, and upon the promotion of his Captain, I. N. Abraham, he was commissioned Captain of his Company, and rendered distinguished service. Hon. Mark Gordon, the father of this family of children, was prominent in public and private life, and, at one time, served as Sheriff of Greene County. His father, John Adam Gordon, was also one of the three men appointed to decide upon a location for the county seat, Waynesburg being chosen over Rogersville because more accessible, though less centrally located. By the roadside in front of the present home of Frank Shriver, stands a large Sycamore tree, said to have sprung from a switch stuck in the ground by Mark Gordon when a boy. We are justified in saying, and not boastfully, that the records show the descendants of John Gordon to have been generally public spirited and upright men and women. They were quiet and unassuming, but ever ready to do well their part, whenever this lot might be cast. They have rendered particularly valuable service in the conduct of church and of local municipal affairs. Their record for good citizenship is one in which we may well feel a pardonable pride, and is a strong incentive to us who follow. The following manuscript of the Gordon Family History called, "The Gordons of Greene County", was written in 1926 by Donald Gordon a g.g.g.grandson of John Gordon. John Gordon, generally regarded as the founder of our branch of the Gordon family in America and commonly known as “The Patriarch”, was born about 1739 (1). In so far as there are any traditions at all on the subject, it seems to be agreed that he either spoke a foreign language or at all events talked with an unusually strongly marked accent, but as to his nationally a striking difference of opinion has existed. The Gordon’s of Green County, Pennsylvania,(2) have strongly maintained that he was a German; the Gordon’s of Ohio, (3) with two exceptions, have been equally insistent that he was Scotch. Whatever the Patriarch’s youthful history may have been, all the traditions declare that he was living in Maryland at the time of his marriage to Mary Duke, about the year 1760. (15) The older representatives of the Green County Gordons thought that this was on the “Eastern Shore,” but there is good reason to doubt their accuracy in the use of that term. (16) The Ohio Gordons, in the person of John Duke Gordon, said that he settled with-in five miles of Baltimore and married there Polly Duke, sister of Dr. Duke, (17) and that their son Bazel was born “July 13, in 1770…with-in five miles of Baltimore. (18) Judge William Henry Gordon added: “I have often heard Grandfather Bazel Gordon speak of being born on the Monocracy Creek, four or five miles from Baltimore.” (19) The Monocracy River is, as a mater of fact, almost exactly forty-five miles from Baltimore. A possible explanation of this discrepancy is that Bazel Gordon (whose statement was undoubtedly oral) actually said “forty-five,”(20) and that his son and grandson understood him to say “four to five.” Mahala (Curtis) Corns stated “that her grandmother, Eleanor (Gordon) Karns was born in Maryland, October 22, 1765 (21); that she had heard her speak of Baltimore and talk of being there; that she thought she had relatives that lived there; and that she had also heard her speak of the Monocracy River.” (22) This statement, while confirmatory of the general locality, does not make it more specific. One thing we know beyond any question – that the Patriarch and his family were living near the Monocracy River in Frederick County, Maryland, as early as July 3, 1777; (23) and the truth may well be that they had been settled there for a considerable time before that date. It was a very primitive community in which the family found itself. (52) “The settlers usually came bringing all their worldly store – consisting of the bare necessities of life – on pack horses…After arriving… the first thing…was the selection of a cabin-site. This was always determined by a good spring of water; and hence the cabin was almost always found in a hollow. Now trees were felled and cut into logs… This done, a day was set for the “raising,” and everyone within five or six miles was notified. The neighbors turned out… and the round logs… were rapidly placed in position… At a convenient height in the side of the cabin an aperture was made by leaving out part of a log, and this space was filled with… paper greased with hog’s lard… to let in the light, while here and there a loop-hole was made so that the cabin might be converted into a fort in case of attacks by Indians… The cracks between the logs were closed with mud. “The furnishing of the cabin was quickly accomplished. Blocks with legs inserted answered for stools and chairs; and for wash-tubs, soap-barrels and the like, troughs were used…A single room generally served the purpose of kitchen, dining-room,… bed-room and parlor. In most families, there were from six to ten children who, with their parents, were crowded into this one room. Often in the winter would they awake to find their beds covered with snow. “These settlers were a hardy, fearless folk, Jealous of their honor and proud of their word, he who impugned the one or doubted the other, had to answer for his temerity at the point of blows. A fight was the arbitrage of any trouble. The records of Monongalia County, West Virginia, were destroyed by fire in 1796; (61) consequently it is impossible to learn how much land the family acquired there. The survey for “Philip Gordon” of 130 acres of land adjoining lands of James Cobun & Robert Brownfield on waters of Booths Creek, dated September 1, 1793, has already been referred to. (62) Quite possibly no other member of the family became a landholder in this locality. Godfrey Guseman was Lieutenant of Captain Samuel Wilson’s company of Virginia militia in the War of 1812. (94) His uncle, Philip Duke Gordon, and John, Joseph, and Isaac Guseman (doubtless sons of Abraham, who had adopted him), were in the same company. (95) Their service appears to have been at Fort Meigs, in the Northwest, under General Harrison. (96) Godfrey is said to have married Margaret (Carroll or Gordon), (97) but if he left descendents, no trace of them has been found. Nothing of any consequence is known about his sister Elizabeth. Rebecca (Gordon) West wrote, March 30, 1908: “I remember seeing a daughter of Elizabeth Gordon Guseman. She was very deaf and talked very loud in order to hear her self”. II. JOHN ADAM GORDON I.
Abigail Karns married Enoch Curtis, and died about 1834, leaving at least two children: Mahala, born about 1829, and Enoch. Mahala married Grafton Corns, about 1846, and in 1908 was living in the suburbs of Caldwell, Ohio. At that time she made the statements on which the two preceding sentences are based, and further said: That she lived with her grandparents, Lewis and Eleanor Karns, in Muskingum County, Ohio, about five miles from Zanesville, from the time she was five until she was seventeen; that her grandmother was a Protestant and belonged to the Methodist Church; that the Dukes were some relation, and that her grandmother’s youngest son was named Stephen Duke Karns; that when she was a little girl she heard her grandparents talk of Scotland, but did not know whether they had ever lived there; that she thought they were Dutch, and that anyhow they were form the Old Country, as she had heard them speak of Germany and of coming across the water; that she had heard her grandmother speak of the ‘low Dutch’ and of the ‘high Dutch’; that she thought her old Uncle William Gordon, who was a brother to Eleanor Gordon Karns, was of Dutch descent and that he lived in Pennsylvania and used to come to her grandmother’s once in a while; that she had heard it said that her grandmother was a hundred years old when she died; that her grandmother was then living with her youngest son Stephen Duke Karns, and died one morning at the breakfast table; and that Enoch Curtis, her own younger brother, was living (1908) at Nashport, Ohio. (124) He was in possession of the old Family Bible already referred to, (125) but correspondence with him elicited no information of any consequence. Another daughter of Lewis and Eleanor Gordon Karns married a man named Joseph. This daughter had a son, Christian Joseph, aged eighty years, living (1908) out on the Marietta road, about three miles from Zanesville. (126) He mad no reply to a letter addressed to him at that time. Stephen Duke Karns, youngest child of Lewis and Eleanor Gordon Karns, left at least one daughter, Mary, who married Jacob D. Mercer, (127) and lived at Carlwick, Muskingum County, Ohio. She referred to Enoch Curtis, of Nashport, as a relative, and she wrote, June 27, 1904: I am trying to find out if there may be any of them (descendants of her uncle Henry Karns) living near Frazeysburg in this County, but was apparently unable to ascertain, as no further letter has been received from her. When the rest came to Greene County in 1795 or 1796… (132) Philip went West – about the time Cincinnati was settled. (133) Philip was a wheelwright and a very good mechanic. (134) He made spinning wheels in Cincinnati for some time and bought several lots in what proved to be important locations. He was doing very well – every family had to have a spinning wheel – but he came back for the girl he left behind, and did not return to Cincinnati for twenty-five years. When he went back he found that his lots had been sold for taxes, and the laws gave the purchasers a good title. Uncle Philip could not get a cent. Philip Duke had no son, (141) but he left two daughters: Mary and Cassandra. Mary married James Austin, and Cassandra (142) married James Steele. (143) A nephew of James Steele, the Rev. M.H. Steele, of Morgantown, West Virginia, wrote in 1909: I have often heard older people speak of Philip Gordon as being a very eccentric man. I recall some very amusing stories that I have heard related, illustrating his eccentricities. William Holland Gordon made the following statement in April, 1901: Uncle Philip was a great reader. I remember one Sunday he was sitting out under a cherry tree, beyond where the old graveyard is, reading. I was a very small boy then and was sent to call him. Just as I got there I saw him staggering, and a great gush of blood was spurting out on his mouth like a fountain. I was terribly frightened and ran to the house, and the people went down and got him. He didn’t live long after that. He was a small man – the only one of his family who was – and his temper was waspish. Philip Duke’s death is said to have been about 1845. Thomas S. Steele, of Fairmont, West Virginia, the last surviving child of James and Cassandra Gordon Steele, wrote in 1909: My grandfather, Duke Gordon, as he was called, died in Monongalia County, West Virginia. I do not know about his birth place. I can’t tell you what nationality he was. He did not have any brogue. He also mentioned Omer Johnson, of Clinton Furnace, West Virginia, as another descendant, but the latter made no reply to a letter than addressed to him. 6.9. and David Franklin born December 22, 1857. 7. Mary Gordon born March 23, 1807, married Jacob Washburn. William Gordon was affectionately remembered by the Gordons of Greene County. He acted as a father to some of them, (179) and was generally recognized as the head of the clan. Mary Hewitt Kuster wrote, may 27, 1901: I had heard…that grandfather William Gordon could not write, but I knew that there were no opportunities in those days, and I knew also that when he came out to Ohio… he was referee and judge by public consent in all maters needing counsel and judgment in all his part of the country. 2. Sarah Gordon born October 10, 1795, married Jacob Johnson of Greene County, Pa. He died may 1, 1832, and she April 1, 1872, leaving at least two sons, William and Jacob. 3.6. Elizabeth Dora, wife of Rev. James E. Mercer, of Clifton, Illinois. Maria Gordon Worley was a member of the Methodist Protestant Church and died February 7, 1877. (189) William Gordon Worley was born august 1, 1846, in Greene County, pa., graduated at Waynesburg College in 1872, taught school, read law with Berkshire and Sturgiss, of Morgantown and was admitted to the bar of Preston County September 7, 1874, and was elected prosecuting attorney in 1876. (190) He was living in Kingwood in 1908. 4. John Gordon born march 27, 1798, died young. 5. Margaret Gordon born October 19, 1799, married John S. Hay, and lived in Perry County, Ohio. He died November 10, 1874, and she November 10, 1875. 9.2.5. Clara N., wife of Corbly K. Spragg. Caleb A. Spragg then married april 6, 1884, Matilda Porter, and had one other child, Porter M.
9.3. William born November 14, 1832, married Sarah A. Brock in October, 1859, had six children and died October 10, 1872. 9.4. Adam married Lydia Pettit December 3, 1858, had four children and died September 10, 1872. 10. Anthony Gordon born august 27, 1807, died young. 12. William Gordon, born January 20, 1817, married Liddy Miller, lived in Perry County and died January 6, 1840. 13. Jane Gordon born October 16, 1818 married William Guyton, and lived in Hardin County, Ohio, where he died December 1, 1859. 14. Catharine Gordon born March 15, 1820, died young. 16. Cassandra Gordon born January 7, 1825, married Peter Cochran (sic), and lived in Perry County. 19. George Gordon born April 1, 1832, married Sarah Ryan born in 1840, (199) and was living as late as 1909 at Arcola, Illinois. In general reference to the descendants of William Gordon, John A. Kuster of Columbus, Ohio wrote, May 18, 1901: Our home Gordons are not wellsprings of information…as I discovered…when I met the clans in Perry County. The oldest living descendants of William Gordon are William and Jacob Johnson, brothers and both octogenarians (sons of Sarah Gordon Johnson). William had no recollection of his grandfather or of any incident in his life… the Ohio Gordons are a sturdy race and have all the characteristics of a fine lineage. While some have risen to local distinction, they are generally a simple hearted, kind people, to whom virtue is of vastly more importance that anything the world has to offer. Mary Hewitt Kuster, wife of John A. Kuster also referred (1908) to a Mrs. Manrice Donahue of New Lexington whose husband was a judge, and whose grandmother was one of the William Gordon’s older daughters, and also to some Gordons living at Mt. Gilead (1902) and at Newark (1908), who she thought were relatives. These localities are all in Ohio. 7.7. Charles Wilson born March 12, 1859, who lived at Chesterville, Ohio.